Some bad weather hit the cast and crew of popular British show "Top Gear" this weekend in Trail, B.C., giving them some unexpected free time in the province's Interior. Co-host Jeremy Clarkson tweeted his followers asking for things to do in the city — population 7,000 — fans quickly came to his rescue on Sunday. Among the suggested tourist tips: take a tour of the local lead and zinc smelter, screen a Swedish film, and learn how to butcher a goat at the supermarket. The BBC show features the hosts testing luxury vehicles and is recognized by the Guinness World Records as the globe's most widely watched factual TV program. Quick question. What can 3 chaps do to kill time in Trail BC on a Sunday afternoon? Someone has suggested we go to their demonstration on how to cut up a goat. Not sure. Jordon Lavigne, who works at the Ferrero Foods, wanted to tweet something funny and unique to grab the "Top Gear" host's attention, he wrote in an email to The Huffington Post B.C. Lavigne ran to meet the TV personalities after hearing they were a few blocks from the store. 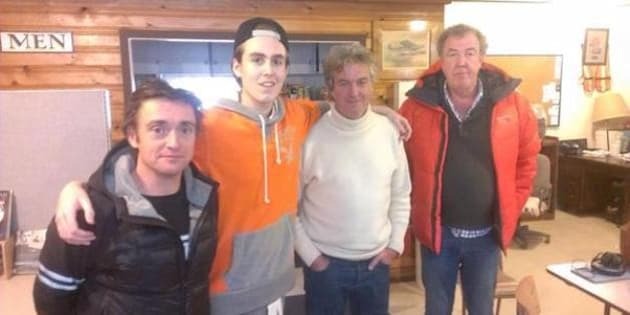 Fan Alex Robinson, 17, who is originally from the British town of Macclesfield, convinced his dad to drive two and a half hours from their home in Grand Forks for the chance to get a glimpse of the "Top Gear" hosts. In an interview with HuffPost B.C., the Grade 12 student said that he jumped out of the car before his dad could even park at the Trail airport. A breathless Robinson shook the "Top Gear" guys' hands, and told co-host Richard Hammond that "he looked a lot shorter than he did on TV." In the end, the "Top Gear" entourage were able to leave B.C. that night. "Top Gear" had been shooting scenes in the Okanagan and Kootenay regions, reported CBC News.